I love me a good brunch. Sadly Legoman thinks it’s a waste of time. And with a toddler and conflicting work schedules it’s a rare treat. I always, always, always order corn fritters when they are on a menu. Especially if they come with avocado and bacon…. mmmmmm… bacon. I was flicking through my recipe folder and got pretty excited to find a corn fritter recipe with no egg!! I modified it slightly to try and make it more kiddie friendly (less spices), sadly Possum still wasn’t keen on them tonight but was happy to gobble up close to a whole avocado and a bucket of yoghurt. Legoman on the other hand said it was a keeper. I chose to make mine little hand size to make for easy dipping, but you can also make them more grown up sized. I reckon they would be even tastier with a little salsa of some kind on the side. Something a little sweet and a little zingy! First make up the yoghurt by combining yoghurt, mint, salt and pepper in a bowl. Set aside. Sift dry ingredients into a bowl. 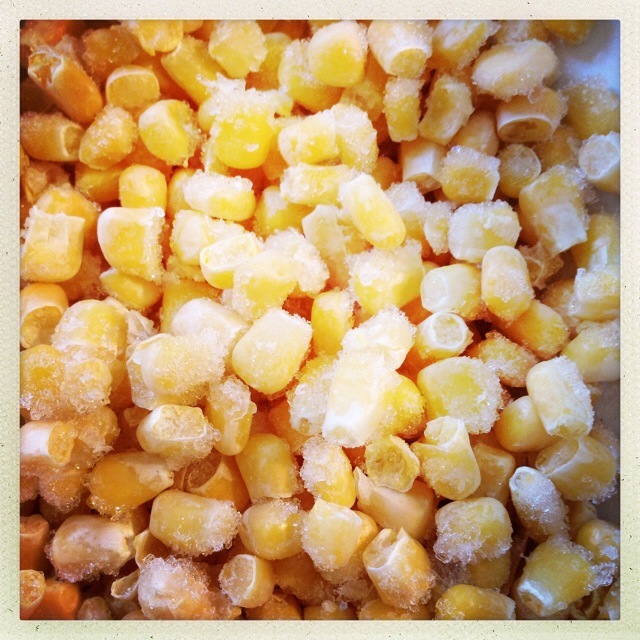 Mix in corn, spring onions and coriander. Stir in milk. Heat 1cm of oil in frying pan to medium high heat. Use a heaped teaspoon amount per fritter, making sure not to over crowd the pan. Cook until golden brown on each side (I left the first batch a little too long and they looked a bit like those old ladies at the beach who could be made into handbags). Remove and drain on paper towel. Keep fritters warm in the oven while you cook the rest. 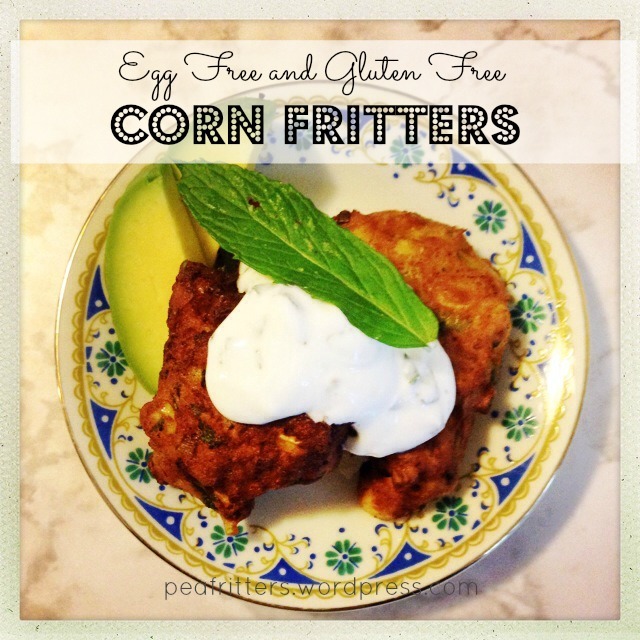 Serve these Egg Free and Gluten Free Corn Fritters with yoghurt and slices of avocado. Yum!